Notes: Known as the Mary Tyler Moore house. The first owner, Spencer E. Davis, was a Civil war veteran. He was a member of the 114th New York Infantry Company K, Army of the Republic. In Minneapolis he was the owner of the Monitor Drill Company. A letter from Spencer's sister is listed in the Minnesota Historical Society's catalog and a photo of him is in the MHS Visual Resources Database. Exterior shots of this home appeared in the popular Mary Tyler Moore television show. 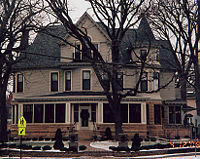 In the show the third floor apartment of Mary Richards, the television reporter character played by Mary Tyler Moore, was in this building at the fictional address of 119 North Weatherly Avenue. This page was last modified on January 27, 2017, at 17:17.